1. It can get quite windy up there and the closer you get to the center of the bridge, the more vibrations you’ll pick up from the traffic. Staying as close as possible to the north end of the bridge will help. 2. I almost never use the “Image Stabilization” feature on my lens, but on this occasion, it came in very handy, even on the tripod. 3. Bump up the ISO on your camera and use a relatively big aperture (I used ISO 400 and an aperture of f/4) to keep the shutter speed up. By the way, can you tell by my tips that vibrations are a big problem here? Don’t worry about the depth of field too much as the distant city and Mt. Rainier are close enough to infinity as far as the lens in concerned. 4. The walkway is relatively narrow, and you may have to move your tripod to let walkers and bikers pass. Isn’t that the houseboat community from sleepless in Seattle? nice work yet again! Thanks, Chris. The light on Rainier is what drew me as well. Deb, thanks! You may be correct about the houseboat community. It’s been way too long since I saw that movie. Unbelievable, Mahesh! 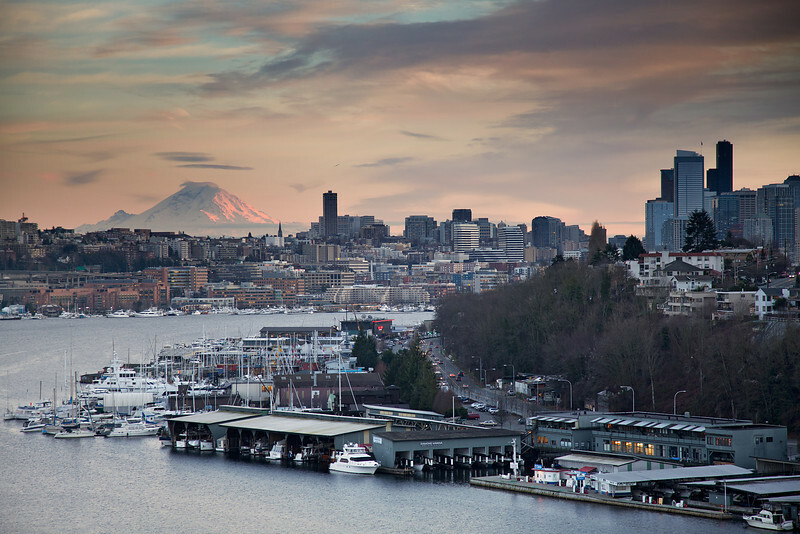 You make me want to live in Seattle! I tried to duplicate your exact shot but did not realize that there is a huge suicide fence running along either side of the bridge. Nonetheless, i managed to stick to a corner right next to the stairs from the Freemont Troll. Next time I will bring my telephoto lens to this shot. Thanks so much for sharing your experiences. I really enjoy your work.